The first part of Peter Jackson's Hobbit trilogy has been chosen for this year's 65th Royal Film Performance. Based on the novel by JRR Tolkien, The Hobbit is set 60 years before the Lord Of The Rings, which Jackson also made into a trilogy of films. The Hobbit's cast stars Sherlock's Martin Freeman as Bilbo Baggins. Organisers of the performance said they are "thrilled" that The Hobbit: An Unexpected Journey will have its Royal UK premiere in London on 12 December. In An Unexpected Journey, Baggins attempts to reclaim the lost Dwarf Kingdom of Erebor from Smaug, the dragon. Sir Ian McKellen returns as Gandalf the Grey, the character he played in The Lord of the Rings trilogy, with Elijah Wood as Frodo and Richard Armitage as Thorin Oakenshield. 'Unswerving support' Also reprising their roles from The Lord of the Rings in The Hobbit are Cate Blanchett as Galadriel; Christopher Lee as Saruman and Hugo Weaving as Elrond. Anne Bennett, the president of the Cinema and Television Benevolent Fund, said: "We are thrilled to be able to host the UK premiere of this highly anticipated first instalment of The Hobbit trilogy." She added that the fund was "thankful" to Jackson and the companies behind the film for "providing this opportunity" and for the "unswerving support the Royal Family gives to our charity". The Royal Film Performance is the main fundraiser for the Cinema and Television Benevolent Fund (CTBF), the trade charity for the UK film and television industries. It provides care and financial help for industry employees and their families who suffer from hardship due to bereavement, illness, redundancy or other misfortunes. The film will have its UK release in 3D and 2D in selected cinemas and Imax two days after the royal premiere on 14 December. 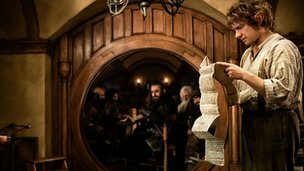 The second instalment - The Hobbit: There and Back Again - is due for release in December 2013.